Your CHEESE survey has made visible how heat (and the energy it embodies) moves around your home, and ultimately how it escapes. Heating is only part of the energy that you use however. Whole-home electricity monitor. This allows you to see the total amount of electricity you are using in your home in real time. 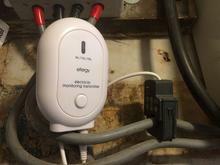 Single-appliance plug monitor. 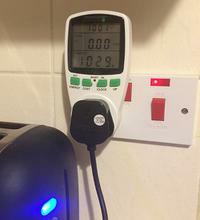 With this you can monitor the amount of electricity that particular appliances use. Two thermometers. You can use these to monitor the temperature of rooms and, by placing one outside, the effect of weather on your energy use. Haynes Eco-House Manual.. This is a practical guide to all aspects of home retrofitting, from heating and electrical systems through to building materials and outdoor space. Now: You have the CHEESE energy-saving box for between two and four weeks to further investigate how you use energy. In two to four weeks: We will collect the box and follow up with you to see what actions you are planning to take. We would also like to get any feedback you have on your experience with the survey and the energy box. In one year: We will be back in touch to find out how you have got on with fixing any of the issues identified by the survey, and any other ways that you have found to save energy. We would also like to find out your total energy use for the year, so that we can compare it to the previous year before the survey. This is important to enable us and our funders to monitor how much energy is being saved by householders taking action following a CHEESE Project survey. Install the transmitter on your incoming electricity cable (see image on right). It needs to be clamped around a single live cable alone and not an earth cable. The live cables are shown with the red tape on them in the picture. It does not matter which side of the electricity meter the clamp goes but the side that feeds the house is normal more accessible. Note that the electricity monitor will not work correctly on a home with solar panels since it cannot distinguish incoming and outgoing current. Set the display to 'Energy now' by pressing the mode button on the top. The 'kW' number is the total amount of energy that you are currently using in your home at that instant. Try switching on a kettle or a toaster and watch the number jump up while it is on. Using 1 kW for one hour is a kWh of electricity and costs around 14 pence. See the next section on recording your energy use for more details on this. Read through the instructions included to find out how to use the other modes. While you have the monitor, you can check the reading as you use different appliances in your home and this will give you an idea of how much electricity they use. For example, when you switch on lights, you would expect it to increase by 20-100 watts, or with an electric oven by 3000 watts (3 kW). It is also useful to check what the background electricity use is. When you are going to bed, only a few appliances would typically be drawing power, such as fridges, freezers, broadband/WiFi and others on standby, and to only be using 100 or 200 watts in total. If it is more than you expect, then you can investigate by turning things off for a short period and checking the change. Plug the monitor into a socket, and the appliance into the monitor. Press the 'Energy' button to display how much power the device is currently using in kW. Press the 'Cost' button to cycle through accumulated energy in kWh, accumulated carbon in Kg of CO2 and cost in £. 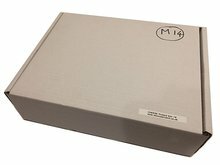 Read through the instructions included to find out how to set the clock and price for the cost mode. While you have the monitor, investigate different appliances in your home and note down how much they use. It is interesting to use it with appliances that you keep on standby, such as televisions, printers etc., to see how much electricity they use when they are not doing anything. Maybe this will make you decide to switch them off when not in use! The thermometers can also be used to record internal and external temperatures to provide a reference for your energy use. The way to do this is explained in the next section on 'Recording your energy use'. The Haynes Eco-House Manual is a comprehensive and practical guide on ways to improve the energy efficiency of your home. It covers work from major renovation to basic maintenance and provides detailed information on the payback period of different remedies. This will hopefully give you lots of ideas and a starting point for taking action in your home. You may find the section on draught proofing particularly useful. Because typical electricity and gas bills are issued quarterly or annually, they make it difficult to track energy use. You can easily record your total electricity and gas use by reading your meters on a daily or weekly basis, and understand the impact of changing temperatures and your own habits. This requires no equipment other than paper and a pen, and optionally two inexpensive thermometers. This is essential for gas since there are no clip-on monitors available as there are for electricity. We provide forms and the thermometers to get you started (see the resources section for downloads of the forms). The two thermometers can be used to measure the temperature inside and outside of your home with each meter reading to show how energy use changes with temperature. Place one thermometer outside of a window in the shade, where it can easily be read, and another inside. 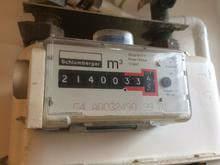 The number displayed by an electricity meter is in units of kilowatt-hours (kWh), which is a unit of energy use. Using one kilowatt hour is roughly equivalent to having a toaster switched on for one hour (as you will soon find out!). 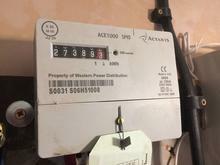 Electricity is billed in these units and, currently one kWh costs approximately 14 pence (inc. VAT), but check the bills from your supplier for the exact figure. To record a reading, read the numbers from left to right, and ignore the numbers in red. If there are two numbers, one of these is for a low night-time rate, but record both numbers using two rows of the form. The number displayed on a gas meter is in units of cubic metres (m3) if it is a metric meter, or in cubic feet (ft3) if it is an old-style imperial one. Gas is also billed in kWh units,and currently the cost per kWh unit is approximately 3.4 pence (inc. VAT), but again please check your bills for the exact figure. To record a reading, read the numbers from left to right and ignore the numbers in red. To convert cubic feet to cubic meters you need to multiply by 0.0283. For example, 300 ft3 is 8.49 m3. To convert cubic metres to kWh, you need to multiply by 11.2206. For example, 8.49 m3 gas is 95 kWh of energy. The Citizen's Advice website has good general information on reading energy meters. The government website has some extra information on gas meters and the conversion required. USwitch has information on how to read your energy bill and extract the important information. As part of the data recording for the CHEESE Project, we collect the total annual energy use for your home in kWh before the survey, and then for the year after the survey for comparison.You can do this by finding a previous bill from a year ago and looking for the meter reading. If you subtract the meter reading from your current reading, you will have the total units used. You can use the method described above to convert the gas reading to kWh. If you don't have a meter reading from a year ago, you should find one of your recent bills and look for an estimate of your total annual consumption in kWh. For reference, the table below shows the average energy use for different sizes of home. You should be aiming to be below average!